Jim Ryan/Special to The Aspen TimesAspen wide receiver Quinn Morehead hauls in a touchdown pass from Rex Christensen during Oct. 8's game in Basalt. 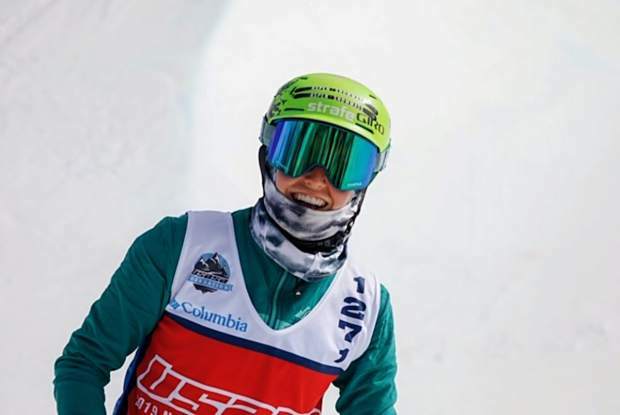 ASPEN – Mike Sirko has not been sleeping much lately. He spends his nights staring off into space or aimlessly flipping through television channels – anything to pass the time. It must be the playoffs. “Oh my god, I can’t wait,” the Aspen football coach said Wednesday. “You know what it is? I feel like a kid again. It’s just excitement, taking my guys into battle and seeing what happens. The Skiers faithful cannot not argue with that. Saturday, they will watch their team make its fourth consecutive 2A playoff appearance. 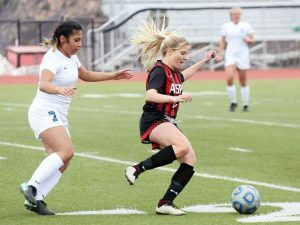 This time, for the first time in program history, seventh-seeded Aspen begins its quest for a first state title at home. No. 10 Platte Valley, the 2007 state champions from Kersey, come calling at 1 p.m.
“Every one of these games is exciting. … I love the atmosphere. There’s nothing better,” Sirko said. 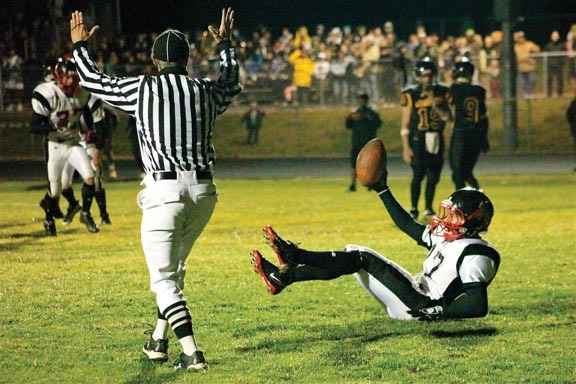 Last fall, the Skiers outlasted Pagosa Springs in their playoff opener, notching the program’s first postseason victory since 1973, then nearly knocked off top-seeded and eventual state champion Faith Christian in a quarterfinal thriller. 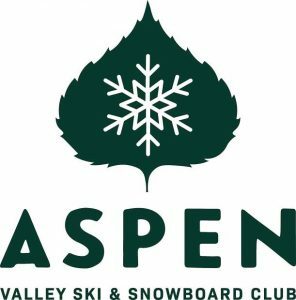 Aspen entered the 2010 season with a Top 5 ranking and state-title aspirations. 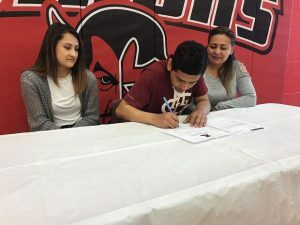 In late September, after a 4-0 start that included impressive non-conference wins over reigning 3A Idaho state champion Shelley and Hotchkiss, the Skiers ascended to No. 1 in the Denver Post’s 2A state poll. Things have not gone quite as smoothly since. Aspen suffered the season’s toughest setback on Oct. 8, when star tailback Nicky Ufkes, a 2,500-yard rusher in 2009, was lost for the season after severely injuring his left knee during the first half of a game in Basalt. 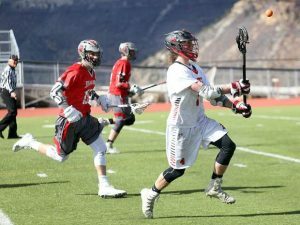 In late October, the Skiers dropped consecutive road games against Coal Ridge and Olathe, effectively squashing their hopes of clinching a Western Slope title. They regrouped in Nov. 5’s regular-season finale, however, pounding valley rival Roaring Fork, 48-0. With that victory, Aspen locked up second place in the Slope and a Top 8 seed in the playoffs, guaranteeing it a first-round home game. Success on Saturday likely comes down to the Skiers’ ability to sustain drives and to contain Adam Hange, the Broncos’ dual-threat quarterback. Hange, a senior and first-year starter, has rushed for 1,197 yards, thrown for 901 and accounted for 24 touchdowns, propelling Platte Valley to a 7-2 record and a second-place finish in the Patriot League. During the Broncos’ current five-game win streak, Hange has averaged 187 yards rushing per game and scored 11 touchdowns. In Oct. 5’s win against Valley, he picked up 349 yards on the ground. “Their quarterback is kind of the man that makes everything work,” Sirko said. “They play in the spread, and he throws and runs and does a lot of things himself. … I don’t know if you stop him, you try and contain him. In Ufkes’ absence, coupled with an injury to Casey Hornburg, Aspen has turned to Daniel Ryerson to carry the load. The senior has responded, rushing for more than 100 yards in three of the Skiers’ last five games. In Nov. 5’s regular-season finale, Ryerson torched the Roaring Fork defense for 131 yards and three touchdowns in little more than one half on the field. Sirko also is banking on a strong performance from quarterback Rex Christensen. The senior, who has battled injury of late, was picked off four times in Aspen’s two losses. He was nearly flawless against the Rams, however, completing 7-of-9 passes for 160 yards and two touchdowns. Christensen has thrown for 710 yards this season, 566 of which went to Quinn Morehead. The junior receiver is averaging 18.3 yards per catch and has scored eight touchdowns. “He seems to be fully healed and ready to go. I think last week was a good time for him to have a good game,” Sirko said of Christensen.